Here at Positronic Design, The SEO Company, we cover a very wide range of subjects and topics with our SEO copy writing and Meta Tagging projects. This requires that we read quite a bit of material about whatever industry we're covering, and be able to make lucid, relevant, topical articles and comments on whatever subject it is. A recent example of this that we're having quite a bit of success with, is for the web site of Phillips Enterprises of Northampton, Massachusetts. 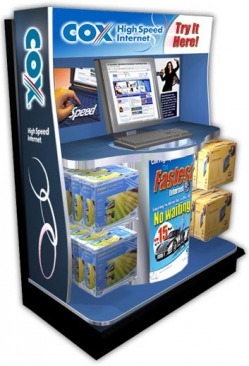 They've been in the business of making innovative, high-quality, custom point of purchase displays since 1974. When we started doing business with them a few years ago, they had a site that was OK, but nothing to write home about, and nothing that was generating any extra action as far as sales leads were concerned. Enter Positronic Design. We redesigned the web site from the ground up and created a 36 page Portfolio of Custom POP Displays, which covers almost every type of retail display you could think of. There are retail point of sale display units for Vitamins, Painting Supplies, NFL and MLB, Floor Tiles... you name it. Tweaking the submitted copy for each of these pages and distilling and composing appropriate Title, Description, Keyword, and Picture Alt/Title Meta Tags from the refined page copy is the very heart of what we do as an SEO Company. and assembled displays. Warehousing and drop shipping programs. Description Tag: Phillips Enterprises is a custom manufacturer of Point of Purchase Display Units and Point of Sale Displays. We design, manufacture, warehouse and drop ship Knock Down / KD and Assembled POP and POS Displays of all types. One major problem they had before was that there were no commas between the keywords, so the search engines think that it's just one giant long-tail keyword, which doesn't help much.